Let us take care of your bags! On the day of your departure, proceed directly to the boarding area without stopping to check in your baggage. Save time and avoid waiting at the baggage drop-off counter. The Baggage Delivery and Pick-up Option is available at the rate* of €35 for the 1st baggage item, then €15 for each additional baggage item, with a maximum of 10 baggage items per order. 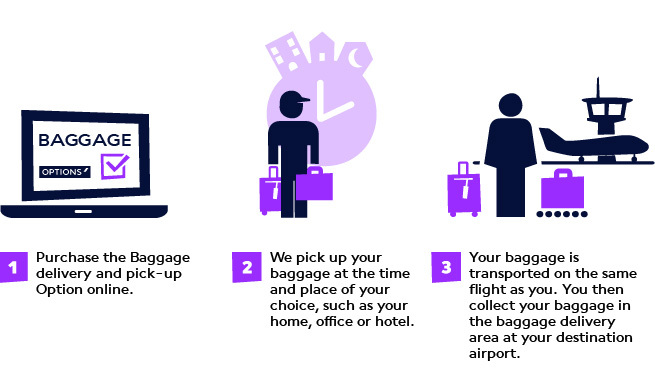 Purchase the Baggage delivery and pick-up Option online and choose the time and place for pick-up. Complete the online check-in** process. This step is required for us to print your baggage tags. We can only transport baggage for passengers who have checked in online. At the arranged time, a staff member from Air France's partner FlyingBag arrives at the location of your choice to weigh, prepare and seal your baggage. The FlyingBag staff member presents you with a service receipt for your baggage. Please keep this receipt until you retrieve your baggage from the delivery area at your destination airport. To ensure the transport of one or more additional baggage items after booking the Baggage delivery and pick-up Option, please contact our partner FlyingBag at +33 (0)1 74 25 55 55. ** All passengers taking part in the trip and wishing to benefit from this service must have checked in online and be present during baggage pick-up. This rule does not apply to children traveling with their parents. Proceed directly to the boarding hall without stopping at the baggage drop-off counter. Your baggage is transported on the same flight as you and you receive your baggage in the baggage delivery area at your destination airport. - Baggage must be closed and labeled with a tag displaying the passenger's name and address before the FlyingBag staff member arrives. We also recommend that you indicate your name and address on the inside of each baggage item. - Please follow all rules for transporting checked baggage items. - You can transport more baggage items than permitted for your ticket by purchasing an additional Baggage Option. FlyingBag staff members can accept your additional baggage items if presented with your payment receipt for this option. - FlyingBag staff members cannot accept sports equipment or special baggage items that require payment of an additional fee at the airport.